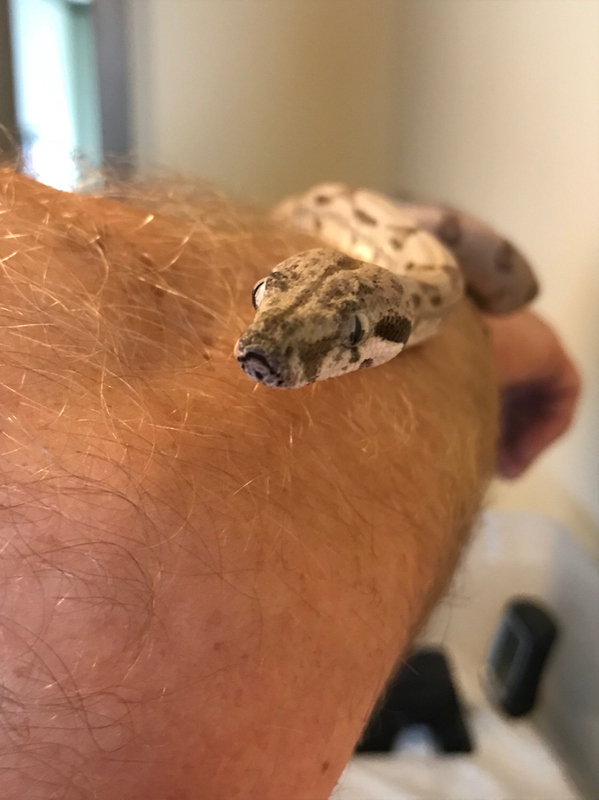 While psychologically it's normal to be apprehensive even about small bites, it's usually not that big a deal with young snakes. 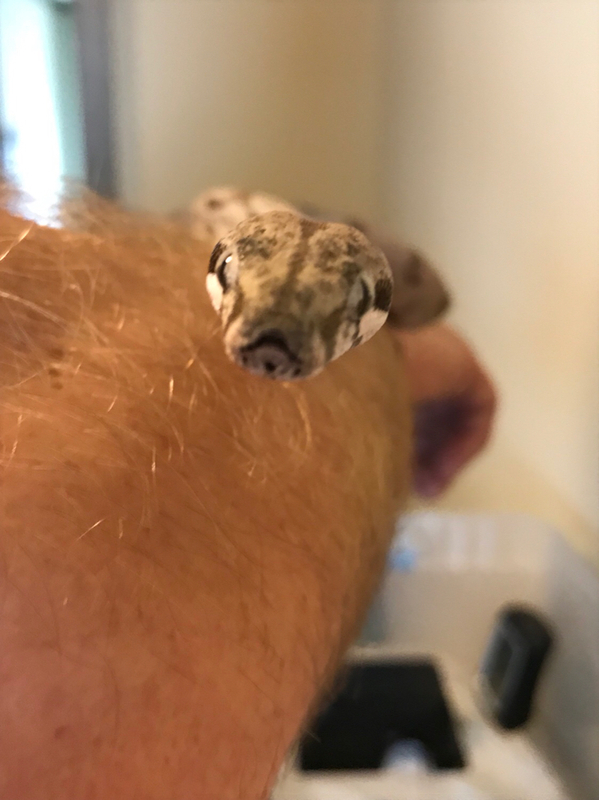 You saw my carpet python the other day, she's only bitten me once accidentally when she thought she was being fed. At that time she was about 3' 9" and I barely felt it. I had to check my hand and saw yup, there's some tiny red pinprick marks so I guess she did get me. Bottom line, it's scary in your mind but you're not going to be rolling on the floor in pain or anything. 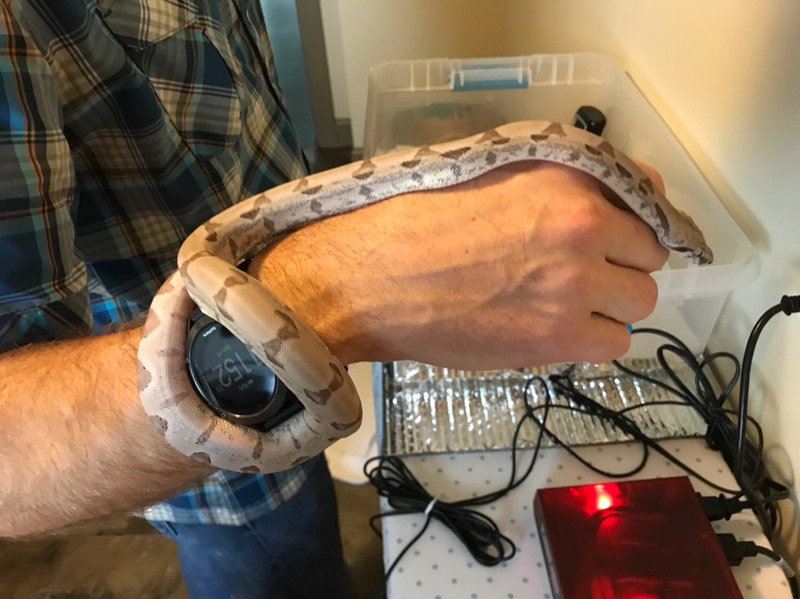 Teeth size/shape does differ between species, I'm not sure how a boa compares to a carpet in that aspect but at least they're roughly the same build so hopefully it's comparable. If anything I would expect an arboreal species like a carpet might have slightly longer teeth because they may need that extra grip to hang onto their prey as they're going to have to support their weight in the air. 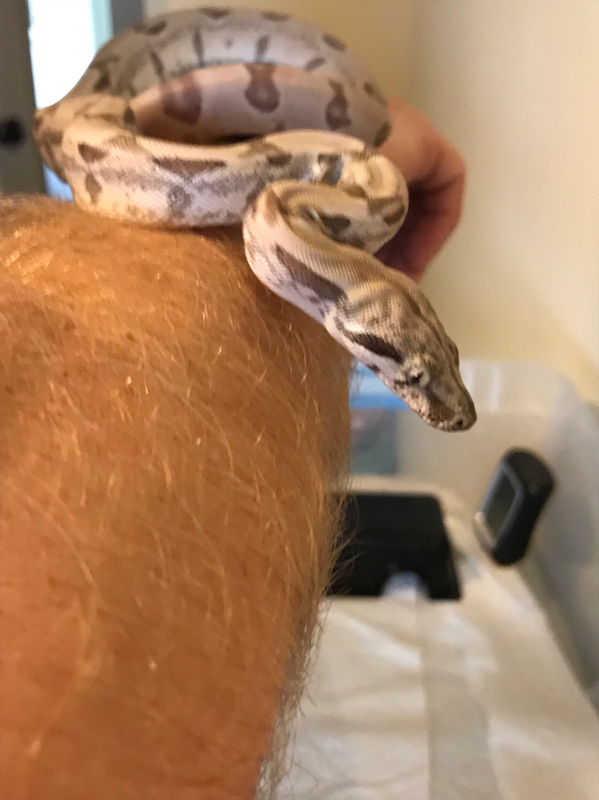 You'll recall that I put on a glove with the blood python, but that's only because I know she's definitely going to bite as well as because I haven't worked with them before so I don't know how strong a bite it will be. I do know that short tails are reputed to hit fairly hard though and while she's not long she's got a lot of weight behind her. Once she's comfortable here and settles down I'll ditch the glove. 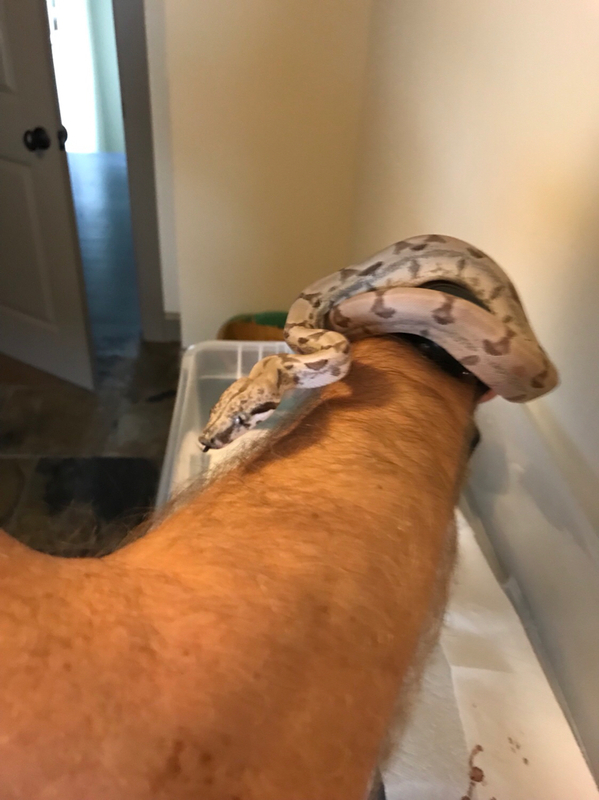 By the time your boa gets big enough that his bites are stronger, I expect he won't be inclined to give them anymore. 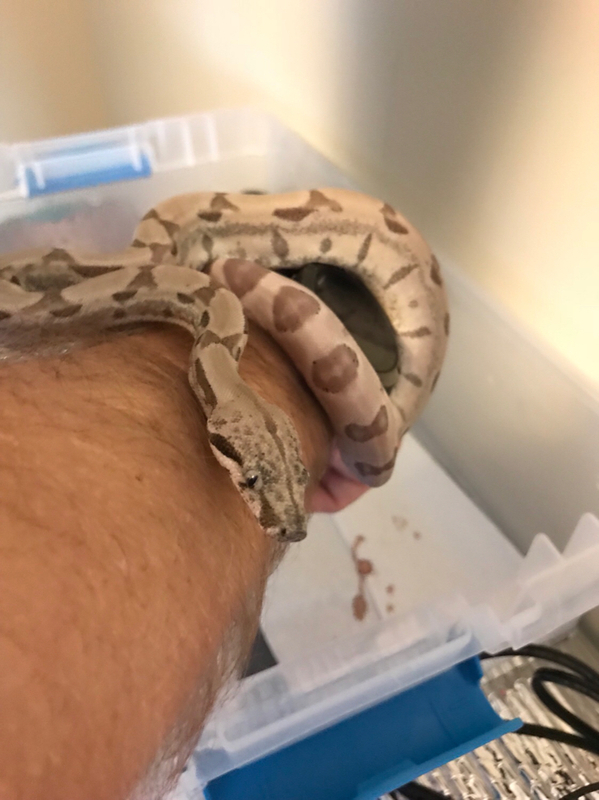 Boas are generally a pretty mellow species, I think this is more of a thing where babies of any species tend to be nippy because they're so low on the food chain so they have to be a bit paranoid. Well it’s Feeding Day #2 already. It’s been 7 days since he ate his first Adult Mouse. Hopefully this feeding goes as smoothly as the last time and I can begin some short handling sessions 48hrs afterwards. Here’s a picture of him in his enclosure this morning. He’s yet to use either of his hides and spends most of the time on the warm side. His ambients have been 75-79, humidity around 80% and his warm side floor temps were about 90 when I set him up. Haven’t checked in awhile because he’s been on that side every time I check on him and I didn’t want to disturb him. I would not be worried that he hasn't used a hide yet. Many breeders use racks and do not have hides. Took Behira a few weeks to get into one, and now, she uses them, sometimes, or partially. Is cool side 75-79? Or is ambient 75-79? Ambient should be closer to 80-82F and cool side can be 78F or so, give or take. If ambient is 75-79F and the hot spot is 90F (which I think should be 86-88F), then Phantom has no choice but to be on the hot spot to stay warm. Make sure there is a gradient, raise the ambient, and lower the hot spot. Just my opinion. Both the cool side surface and ambients are 75-79 and I'm measuring Ambients by sitting an Accurite (w/o probe) unit on the cool side. 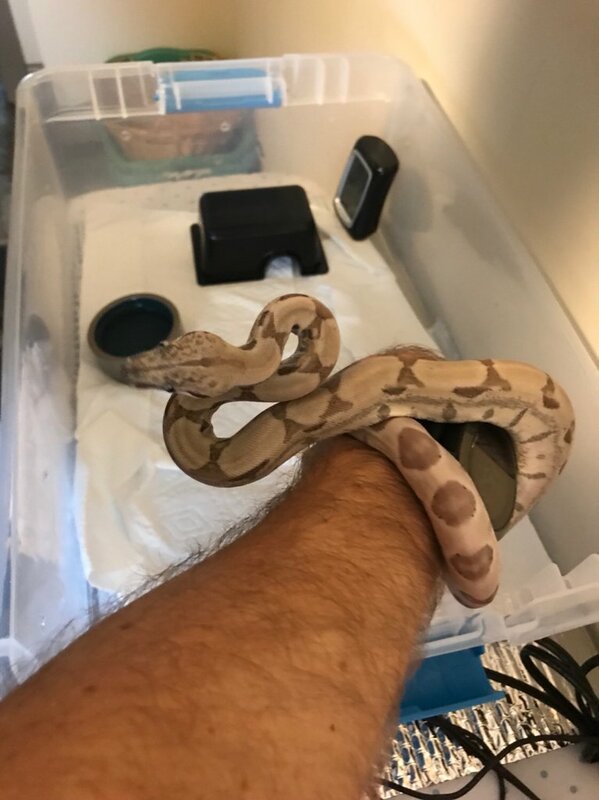 I was also a little concerned by only getting mid 70s and was about to invest in another UTH for the cool side but was told by both the breeder and several on here that it wasn't an issue and to only worry if it dips under 70. BCI's can handle lower temps than some other boids as well as drops, especially at night. However, I still think the hot side is a little too hot and that's a wide gradient. If phantom is always on the hot side, even when not digesting, he's telling you something. IMO. I also think 80% humidity and under 75F would be asking for trouble. Again, just my opinion. Last edited by dakski; 08-16-2018 at 11:03 AM. Most of the drops (75ish) are at night or earlier morning. I'll go ahead and lower the hot side this weekend to get closer to 88. 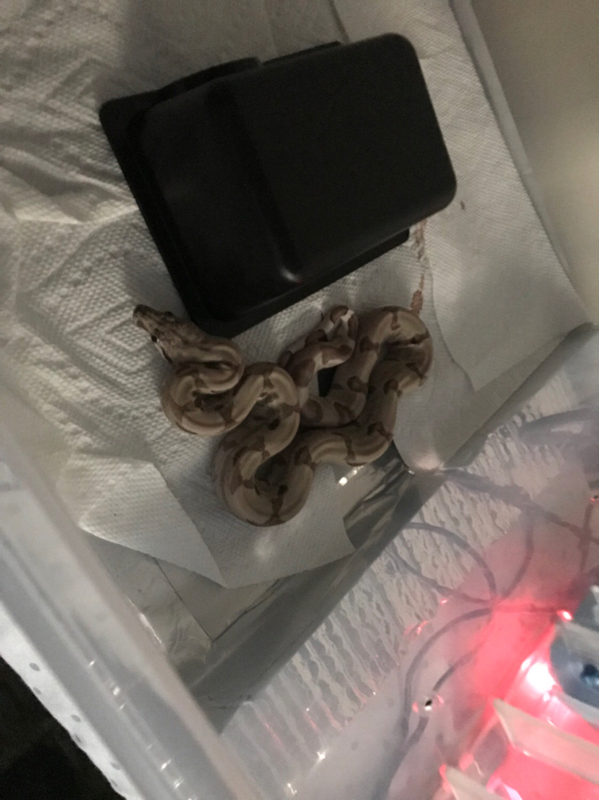 My plan was also to add more holes in the enclosure to reduce the humidity a little but I wanted to avoid disturbing him for the 1st two feedings. And I have seen him exploring the cool side, just never hanging out there like he does the hot side. Appreciate the opinions. 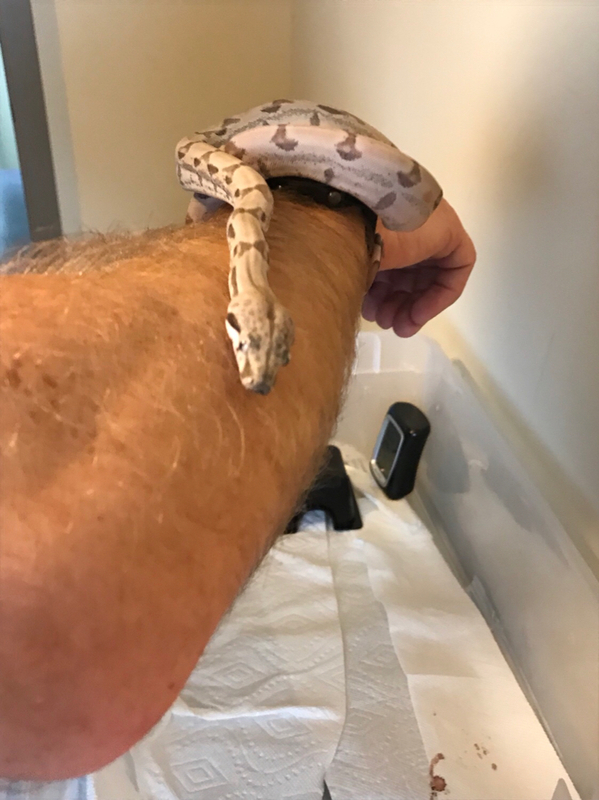 With two successful feedings followed by 48 hours of waiting, I finally was able to start some short handling sessions with Phantom. Up until two nights ago, I never witnessed him using either of the hides. I decided to bump the temps down just a little and all of a sudden I found him in the hide nonstop. 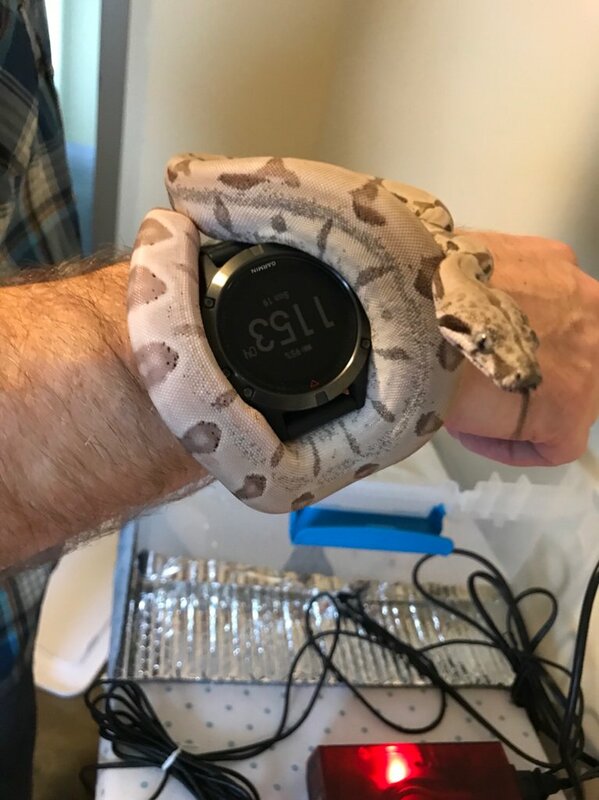 So either it was a temp issue or he finally realized what a hide was. I was almost a little worried what I might find when I lifted it a couple hours ago since I haven’t seen him in two days. Here’s some pics my wife snapped during the quick session. It actually went better then I thought it would. 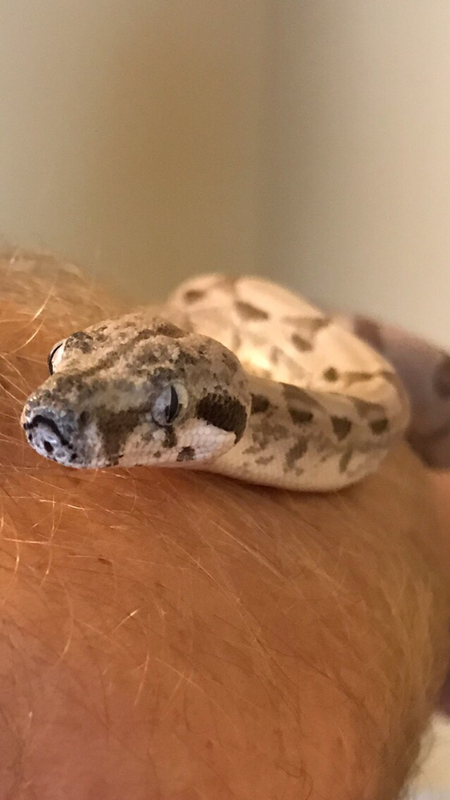 He was squirmy but chill at times. Very curious while making sure his tail was securely wrapped around my hand. Very happy with session #1 and looking forward to the next. I also introduced some hook training. Glad handling went well. It will get easier and he will get calmer from here. Give him a few weeks and he'll be a different snake. Congrats on the consecutive successful feedings and positive handling session Kuhn. Those are some cool pics of your handsome critter. Sounds like you two are off to a great start! !